Text © Copyright March 2019, JThomas; licensed for re-use under a Creative Commons Licence. The British Rail Class 175 Coradia is a class of diesel multiple-unit trains. They were built by by Alstom at Washwood Heath in Birmingham between 1999 and 2001. A total of 27 sets were produced in two subclasses - Class 175/0 (2 cars per set) and 175/1 (3 cars per set). The two-car units are numbered 175001–011, and the three-car units 175101–116. 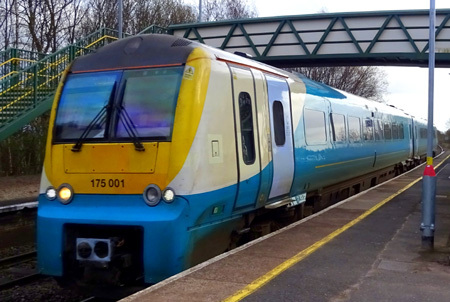 The entire fleet is owned by the rolling stock company Angel Trains and are currently exclusively operated by train operating company Transport For Wales.